December 16, 2008, 0950 hour. I was busy cooking for daughter #2's birthday dinner for her 30 guests. I was waiting for an important text message so I assigned daughter #4 to man my mobile phone. I have not forgotten about the post event blog. It's just that due to the pre-Christmas hubbub, I subconsciously wished that the contest was light years away. I blog to air my angst, rave or rant. I have no illusions of being a literary genius. Far from that. Nevertheless, I write what I have or want to say. It's liberating, you know, to say what you have to say. When SONY in conjuction with Nuffnang sponsored a blog post contest, I said to myself, 'why not?' I was pleasantly surprised to have been chosen to be one of the top 50 shortlisted VIP bloggers who made it to the finals. To attend or not to attend. That was the question. What the heck! I confirmed my attendance and that was that. December 6 dawned gray and overcast. Ethan was excited to tag along while I was overly apprehensive. Questions kept running in my mind. Would I look silly rubbing elbows with bloggers half my age? Would I meet someone I know through our blogs? Would the event be a run-of-the-mill exhibit? What are my chances of winning against seasoned writers and bloggers? I felt so inept due to my IT expertise - the lack of it. Should I just turn the car back and go home and forget all about this? Before I can formulate new questions, I was in front of the SM Convention Center. I parked the car then Ethan and I went inside. We were greeted by a long queue of youthful looking faces at the registration area. 'Bloggers register here please' said the well-modulated female voice. Ah! Great! A special registration line for the invited 50 bloggers. I stood in line and talked with the young girl in front of me - Kim of Riyomantic, 17 years young. We decided to seat together as we went inside the exhibit area. I fleetingly looked at all the products on display before we proceeded to the reception area. A banquet was laid out for the invited bloggers and media people. The buffet meal was delicious. The service was efficient. It seemed that everyone involved in the SONY Expo were tuned to be attentive and well-mannered. Our table was then gradually filled by other bloggers (Mike, Sheng and Dondie) and the media. The program started and we were glued for the emcees were the three stooges of "Boys' Night Out": Slick Rick, Tony Tony and Sam Y.G. The program progressed with some song numbers and Vaio's ramp walk. ..... 'and the three commendable bloggers are: eMz, John Dale and Lina', announced Slick. I stood up with a wide silly grin plastered on my face. I even had the tenacity to shout to Slick "It's not Lina. It's Lena!" My 3-inch heels went tick-tocking on the floor as I hurriedly went to the front of the stage. I was about to climb the steep stage steps when I realized there were no handrails. 'Kuya', I said to one of the production crews, 'please hold my hand so I will not fall.' I was on stage and looking at the assembled guests but not really seeing. I could see the joyful face of 6 year-old Ethan seemingly so proud of his 'grandmom'. I received a SONY Music player. Cool! The grand prize, awarded by the stunning KC Concepcion, went to my new online buddy Mike. We were all so happy for him. After the awarding and the obligatory congratulations Ethan and I proceeded to check out SONY's eight world breakthrough technologies. I looked and tried on each single product. I have no high-sounding-tech-words to impart regarding the beauty of these products. All I can say is SONY's eight world breakthroughs "rock!" The products are easy to handle and operate - even a tech moron like me can do it. That's the beauty of all SONY products - high technology within the reach and grasp of the common people. My favorite among the lot is the World’s First Noise Canceling Notebook Computer: VAIO T Series. It is lightweight, with exceptional audio and visual performance, and noise-canceling feature - every blogger's dream laptop! I just fell in love with the unit! I wish it could be mine! The red one! With the Vaio's noise-canceling feature, a bomb could be exploding right behind me and I wouldn't even know. Ethan and I continued to visit each and every booth. The technology displayed right before my very eyes were outstanding and the top in line. I was amazed! Thirty years ago, my radio cassette player was the top dog! 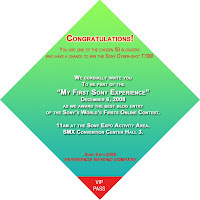 The SONY Expo 2008 event was an experience to remember. As I look back, I can't decide which part was my favorite. Was it the part where I received one of the commendable entries award? Is my favorite part the one where I met some new friends and stalked others? of SONY's eight world breakthroughs and pretended they were all mine? I don't know... I loved every part of it. I can rightly say my favorite part of the SONY Expo 2008 Event was the whole encounter itself. An hour plus of walking and standing put a strain on my aching three-inch-heel-shoe-clad feet. I needed to rest my feet. I proceeded back to the quiet reception area and sat alone on one of the empty tables. I slowly, inaudibly and obscurely took off my shoes, put my feet up on a vacant chair and relaxed my aching feet. As I look around the throng of people teeming about the area ooh-ing and aah-ing on the marvels of SONY technology, I can't help but beam. I have no technology or computer background - no gadgets nor software to do amazing stuff for my post. But! While most of my contemporaries are back home contemplating on how to turn on a computer much less e-mail, here I am, past the century mark, hobnobbing with this community - half of which young enough to be my children, joining a blogging contest, comprehending the nanotechnology within my reach, appreciating and thanking the people behind SONY for the awe inspiring products they continue to develop and offer for the good and improvement of the common people, like me. Kudos! I take my hat off, so to speak. What could make this SONY day more perfect? 'Ma'm, would you like a cup of hot brewed coffee?' asked a smiling waitress who silently materialized by my side. I looked up the pretty waitress, smiled in reciprocation and answered 'sure!'. *note: Using my "age" as leverage, I scored all these pictures from other people's cameras as I don't have one. I would like to thank those who were patient enough to oblige. Thank you too SONY and Nuffnang. You ROCK! WOW! Congratulations Lena! Being chosen as one of the commendable bloggers is already an achievement! Well, it's not surprising that you won, I've been reading your blog here for months already and you have well written posts, galing talaga, so I commend you myself! Anyway, si Illac Diaz ba un, ung nephew ni Gloria Diaz? Gwapo ha! Love all the photos! Beautiful! debbie/dana: thank you.=) yes that's illac diaz. i actually approached him and said " hi! i'm your stalker in multiply lenaleng". he actually said "oh hi! sorry i didn't recognize you in person" lol! yes, i hope to meet you properly next time too. hello po sana manalo kayo..hehe..
oh what fun! and your photo comic balloons are funny! you have a picture with iliac! wowowee! fortuitous faery: yah! and boy! does he smell good! i could have stayed glued to his side until Christmas but he budged! lol! actually, BBQ at kanin lng ung nabalot ko eh..hehe :) Di nyo kc ako tinulungan ni Kim na ipuslit ung Bravia! hmmp! naku, mukang maraming mananalo ng VAIO! Lahat magaganda ang entry, lahat may funny stories to tell.